The Method Integration Listener is a tool that listens to real-time to changes that occur in QuickBooks, and notifies the Method Integration Engine to update the server. Verify that Method Listener for use with QuickBooks is listed. If it is not listed, perform a complete installation again by following the steps for installing the Method Integration Engine. Click on the Integrated Applications icon. Ensure that Method Integration Engine Listener is listed. If it is, ensure it has a checkbox under the Allow Access column. If it is not, open the Method Integration Engine and click Synchronize > Changes-Only Synchronization. Once the synchronization completes, close and reopen QuickBooks, and try steps 1 to 3 again. Type C:\Program Files\Method\ListenLog.txt and click OK.
Based on the date of the last entry, you should see evidence of recent changes being detected. If changes are not being picked up, check if the Engine is running by right-clicking the clock in the lower right-hand corner of your screen, choosing Task Manager, and ensuring MethodQBListen is listed under the Applications tab. If MethodQBListen is running, but changes are not being written to the ListenLog.txt, there could be a permissions issue. Right-click on the Method folder, and choose Properties. Ensure Full Control is granted to all users on this folder. 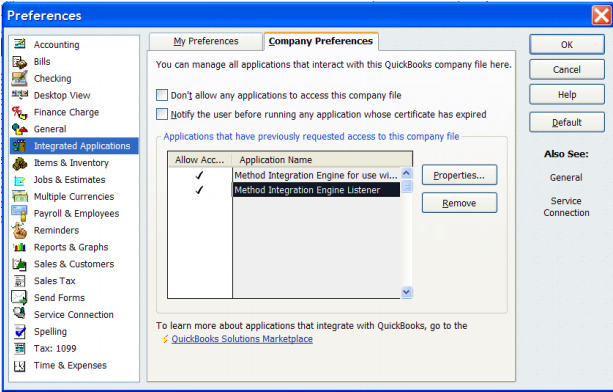 If MethodQBListen is not running, but Method Integration Listener is listed under Integrated Applications in QuickBooks, there could be a problem with a corrupt COM Add-In file for QuickBooks. Delete the file C:\Documents and Settings\AllUsers\ApplicationData\Intuit\QuickBooks\qbsubconfig.xml. If you are unable to locate this file, use the Find tool on your computer to search for the file called "qbsubconfig.xml". Deleting this file will cause all QuickBooks COM add-ins to re-create their subscriptions. This should happen automatically next time QuickBooks is started. If you are using Windows XP, the Engine Log folder is typically C:\Documents and Settings\AllUsers\Application Data\MethodIntegration. If you are using Vista or later, the Engine Log folder is typically C:\ProgramData\MethodIntegration. Click Show hidden files and folders. If you want to see system files as well, unclick Hide protected operating system files (Recommended). Delete the log file if it already exists. This is typically your QuickBooks Company File.qbw. Ensure the Method Integration Engine is open and connected. If the Method Integration Engine is not open, click Start > Programs > Method > Method Integration Engine for Use with QuickBooks. If the Method Integration Engine is not visible, right-click on the icon in your taskbar next to the clock in the lower right-hand corner of your screen, and click Display. Make a change in QuickBooks, such as creating a new customer. Refresh the Engine Log folder to see if the log file was recreated. If the log file was not recreated, there may be a permissions issue on this folder (see next step below). If the log file was recreated, open it and see if the change was picked up by the Engine. If the Method Integration Engine is open, and it is currently not synchronizing, and the log file is empty, everything is working as it should. However, if it is currently not synchronizing and the log file is not empty, there may be a permissions issue on this folder. Add permissions such that all users have Full Control and click OK. If the steps above succeed, the Method Integration Listener is working correctly.